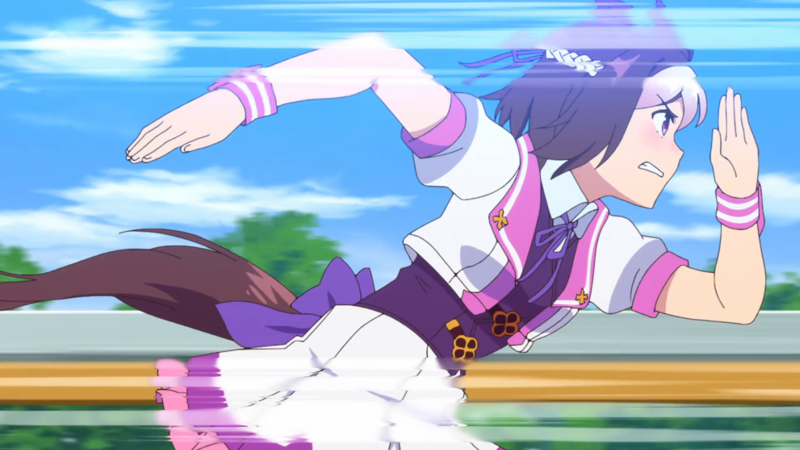 Premiering earlier this spring season was Umamusume: Pretty Derby, an anime series featuring horse girls – “human” girls with horse characteristics such as tails and ears, not to mention speed – competing against each other in horse races to become the fastest runner in Japan. With an underlying setting of certain women becoming pregnant with otherworldly horse spirits that would fit right in with some ancient mythology, cute anthropomorphic horses, exciting races, and idol performances to boot, I expected Umamusume: Pretty Derby to be a breakout hit. It also carries the name of P.A. Works as the animation studio behind it, a studio which has also put its name on popular series such as Shirobako, Eccentric Family or Hanasaku Iroha. Yet, if you look at its popularity on websites such as the database MyAnimeList, or even its official streaming website Crunchyroll, it surprisingly falls far behind other top-ranking anime airing this season. 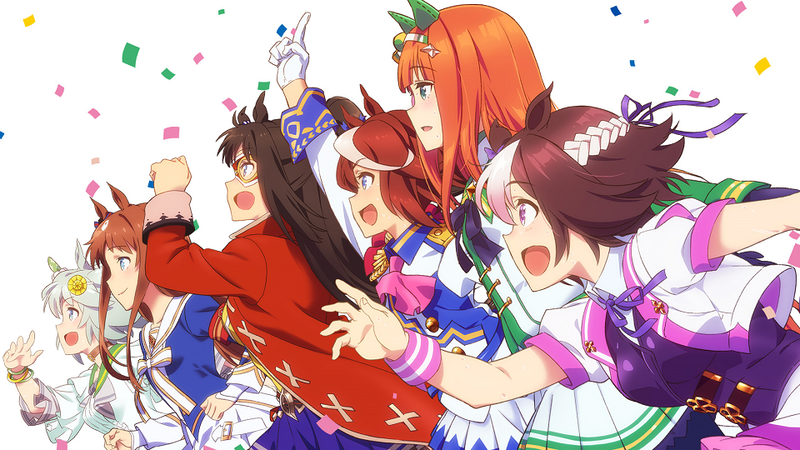 If you have followed me on social media it is likely you know that I am a big fan of Umamusume: Pretty Derby and its antics. The truth is that I have been excited for it ever since the video game developers Cygames (known for the popular Granblue Fantasy) released an animated trailer for their upcoming mobile game with the same name back in early 2016 – a game that has yet to be released two years later, with a goal of releasing later this year. When this trailer released it was as intriguing as it was hilarious due to its concept, but also featuring an energetic cheery song and somehow even ice-skating. In less than two minutes it had managed to establish an absolutely bonkers of a setting, and characters with distinct personalities and appearances. As very little information was revealed at the time apart from an obscure manga, I hoped it would eventually also become an anime TV series (it would eventually turn out to be a cross-media project!). And here we are, two years later, and I love every second of it. Umamusume: Pretty Derby also has a lot of visual gags, many of which are easily missed as they are in the background and never highlighted. 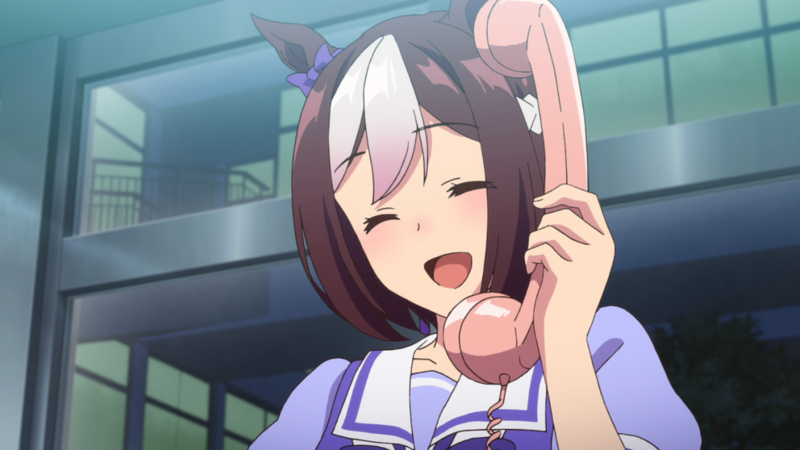 What makes Umamusume: Pretty Derby stand out to me is that it goes all in on its concept, fully embracing how silly it can seem at first glance. After all, who would have thought of horse girls who compete in horse races and do idol performances? Yet, it is its love for its own idea that makes it work. All characters are based on real-life racehorses and either share their appearance, name or even behavior (Gold Ship’s unpredictable eccentricity is a notable example), one of the race commentators have been the protagonist Special Week’s very own jockey Yutaka Take, and some events are even based on real life to the point where articles on horses can be considered spoilers. This is not even taking into account loads of carrots, telephones fit for horse girls’ ears (because those are their actual ears! ), and even the horse girls nailing their own shoes just as one would do with real horseshoes! But the series embracing its own absurd premise is not the only thing that has made me fall in love with it. We also have a brisk pacing with development that constantly moves forward, comedy that actually makes me chuckle audibly, characters that are filled to the brim with positivity and motivation, and lots of defining moments that make me feel like I am watching an actual race. I feel with the characters, and Special Week especially, as they race each other. I root for them to the point where I almost ended up loudly cheering a few times – it is just that intense. When the races are over I also feel overjoyed or breathe a sigh of relief. The only other anime series that off the top of my head has made me react like this due to sheer intensity are Tengen Toppa Gurren Lagann or The iDOLM@STER, which should give an idea of how invested in the series I have become. And this is coming from a person who struggles to find excitement fin watching sports. I’m rooting for you, Special Week (Spe-chan)! One aspect of the races I love dearly is their use of crowd cheers and reactions. During the races, we can hear the crowd cheering for the contestants or gasp in surprise at the turn of the unfolding events. Another anime that features crowd cheers is the aforementioned The iDOLM@STER, in which the audience shouts accordingly to the idol performances’ beats. To me the use of crowd cheers creates an immersive sensation and makes it feel like standing in an arena full with other people. 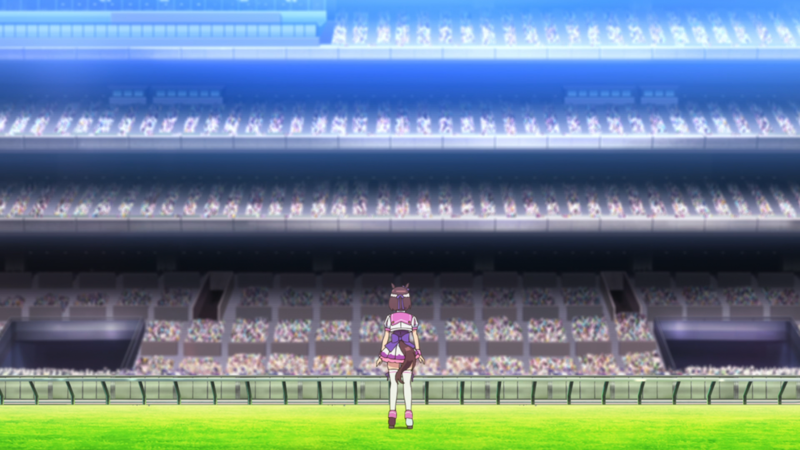 The races in Umamusume: Pretty Derby are not done in an eerily silent vacuum; they are huge spectacles that are viewed by perhaps the whole world and it not only shows, it also feels. I should here also note that I believe one reason this effect became especially effective in Umamusume: Pretty Derby is because the audio featured in Crunchyroll’s official videos is likely not as intended when compared to the Japanese TV broadcast. Sound effects are much louder than they should be (spoiler example: TV, Crunchyroll), which makes anything from the crowd cheers to Special Week increasing her speed a riveting roar of thunder. Unfortunately, the sound effects become strangely distorted in some later episode making it hard to listen to (presumed to be fixed at a later date). Luckily, more recent episodes lack the distorted sound effects, but they also lack the sheer intensity from the earliest episodes, meaning that while the races are as intense as ever, they to me feel ever so slightly less so. But at this point in time I am so heavily invested in the setting and the characters that it does not matter anymore. I want Special Week to win and become the best horse girl in Japan. So here I am, sitting in front of my computer and cheering for horse girls while having a great time. A great time that was partly amplified thanks to a complete blunder in sound mixing to boot. What could be expected to have been a shallow anime series only meant to promote an upcoming mobile game has instead turned out to be a labor of love with a sincere heart. If anything, it shows the way of how to market a potential future franchise. Will I play the mobile game, assuming it reaches English-speaking territories? Time will tell. But in the end I will always remember the time when I nearly cheered out loud for Special Week and the gang to win a race. Umamusume: Pretty Derby is a whole lot of fun and is everything I could have asked for and so much more. This entry was posted in Anime, Editorials, Series, Umamusume: Pretty Derby and tagged Anime blog, Anime Viking blog, Anthropomorphic anime, Crowd cheering, Gold Ship, Horse girls, Intense anime, PA Works, Special Week, Uma Musume, Uma Musume audio sfx crunchyroll, Visual gags.